The SEMToolBar is a free browser plug-in that has some incredibly useful features that can help you with competitor research and optimizing your Web site. Available at www.bruceclay.com/web_rank.htm#semtoolbar, this toolbar also supports 20 different languages and has features that help if you’re trying to optimize a site for another geographical market, whether inside the U.S. or abroad. You can install the toolbar for Internet Explorer or Mozilla Firefox browsers. After it’s installed, it shows up at the top of the browser window with your other toolbars. The SEMToolBar gives you a big advantage for doing competitive research, finding keywords, identifying your target demographic so you can cater your landing pages to them, looking for sites to request links from, or just checking out someone’s Web site. Keyword statistics: A box with important keyword data displays at the top of the SERP. The various results include approximately how many times the keyword is searched each day, the categories it’s considered to be part of, statistics related to paid search advertising for that keyword, the demographics (age and gender) of people who search for that keyword, and the keyword’s search volume over the past 12 months, shown as a line graph. 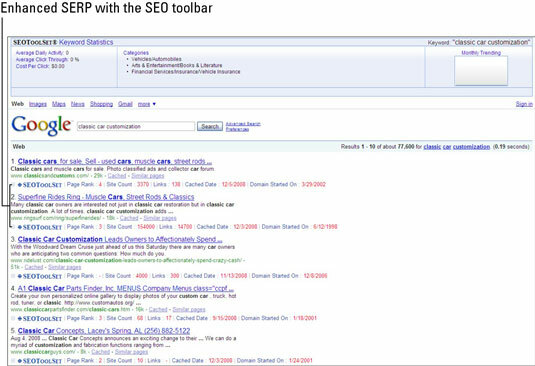 The toolbar enhances SERPs with keyword statistics and facts about each Web page. The toolbar also helps you when you’re browsing the Internet. You can look at the toolbar to see things about the current Web page, like its backlink count, PageRank, date the domain started, and other facts that help you determine how viable the Web page is. When you’re looking for good sites to request links from, for instance, the toolbar can really come in handy to give you the scoop on a potential candidate. You can conveniently run searches from the toolbar directly and specify the search engine, keywords, and proxy location (where you want the search to run from). For instance, imagine you’re working on an Australian version of your Web site and you want to see how you’re ranking there. You could run a search as if you were in Sydney, even though you’re really in California. This feature is called proxy search, and it lets you run a search as if you were physically at a computer in another place. Being able to run a search as if you’re in another place gives you a huge advantage when optimizing a site for local search somewhere else. Search engines increasingly personalize the results to each individual searcher and localize the results geographically, when it’s appropriate. So proxy search gives you a way to get around these obstacles and run searches from another place (without having to buy a plane ticket and go there).